What was supposed to be a quick round one for some teams has now turned into an all out slug fest that all look headed for seven games. There will be six game sixes played over the next few days with major implications on the line. The sixth seed +Golden State Warriors can close out the three seeded +Denver Nuggets tonight at home marking the first upset of the playoffs, while up in The Windy City the fifth seeded +Chicago Bulls can upset the fourth seeded +Brooklyn Nets at home as well. Meanwhile the Knicks, Pacers, and Thunder will all have the tough task of closing out their series on the road tomorrow night. These first round match-ups have given us some compelling story lines that will only continue to get better this weekend. With the Celtics and Rockets staving off elimination, extending the series and winning on the road last night, the tides are now turned and the pressure is on the Thunder and Knicks to win hostile game sixes on the road. They are both trying to become the first teams to win a series down 3-0. The Knicks looked lethargic and lazy all four quarters last night, settling for jumpers and taking way too many three point attempts. Meanwhile the savvy veteran Celtic squad pulled out another vintage playoff win and look to even the score back home. Down in OKC the Thunder looked lost without Westbrook as the team fumbled down the stretch and Kevin Durant moped all over the court the entire fourth quarter. The Rockets are playing small ball and have become a match-up nightmare. Scotty Brooks is going to have to change his entire game plan because Houston is young, athletic and shooting the lights out of the building. 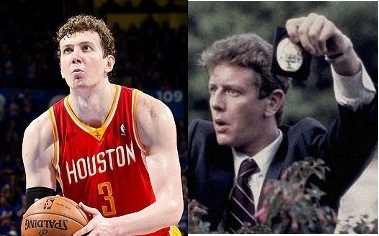 Last night Omer Asik was trending for many reasons. The Hack-Asik technique was a poor attempt by a number one seed to crawl back into a game they had already lost. Bad form. The Turkish Tower made them pay by sinking 13 of 18 free throws, but the more important item of note was trying to find out how he and his twin brother Judge Reinhold were separated at birth. Omer and Judge. Judge and Omer. Momma must be proud.